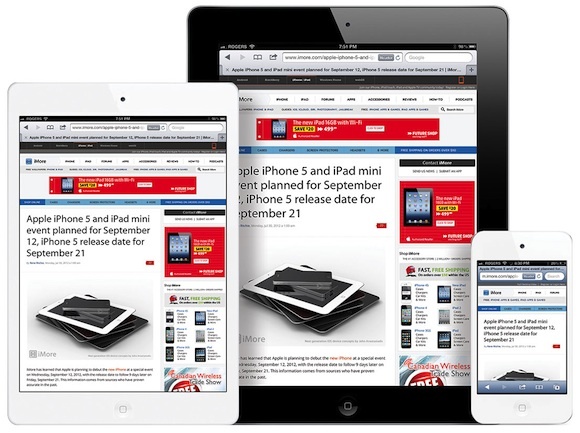 Apple to Ramp Up 7.85″ iPad Mini Production in September? Digitimes reports that the long-rumored 7.85" iPad will begin volume production in September with a target of 4 million units per month. Supply volume of Apple's 7.85-inch iPad is estimated to reach four million units per month starting in September in order to prepare for demand from year-end holidays, according to sources from the upstream supply chain. Digitimes... might as well be the Onion. I don't know why but I feel like I need one. Can't decide if I'd want this over my 10.1. SJ would never Launch something before the holiday! "Honey..u know how we hate when the 18 m/o baby cries because her sister won't let her play with the iPad? Well, I found a solution..And the only reason im gonna do this is to eliminate some stress out of your life..Because I love u"
It's interesting that in this event the iPad mini will be the show-stopper instead of the iPhone. Look up in the sky...Right now. Did u see it? It was the joke going over ur head. Sad that Apple is so quick to toss out Steve Jobs' opinions now that he's dead. Steve knew that the public wanted a 10 inch screen.... hence why iPads dominate the market and no one can even name an android tablet. He would have never let this 7 inch iPad happen. I really did not believe they would make a smaller iPad. But these rumors just ain't quitting. I think there is a definite market for 7 inch tablets if they can get the price point down a bit. The nexus 7 is a lot of tablet for $200 and I know apple can do better. If this happens with either a 200 or 250 price point then android prices will crumble. There is no such thing as competition in a market where apple covers every price and spec point. This is literally exactly what happened with the iPod. They launched one, it was a hit and they easily claimed over half the market. They launched another, and the term iPod became synonymous with every MP3 player available, not to mention a 90% or so market share.